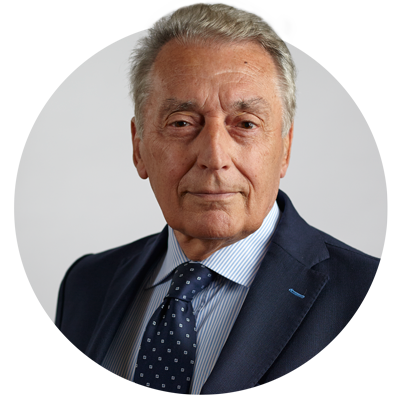 Pietro Raugi is a veteran of international business, as well as a successful entrepreneur and executive. His work includes building, restructuring, and managing companies in the US and Europe. A recognized authority in international relations, with a deep understanding of the American market, he maintains an extensive network of relationships with foreign companies, officers, and managers in the professional and cultural world. Prior to co-founding IMARK, Pietro was President of Lepanto in charge of Venice Works and MOSE, Founder and CEO of Safe Technologies, CEO of Metalmeccanica Fracasso, CEO of Travature Alta Velocità, President of Palomar, Director of Centro Intermodale dell’Adriatico and Cantieri Navali Arsenale, President of BASE (Bonifica Acustica Sistemi Ecologici), President of Frame Engineering, Director of Costruzioni Metalliche, President of SIAR (Sistemi di Armanento Ferroviario Impreglio Consortium), Director of FIP Energy Absorption Systems, CEO of Franchin & Son, and CEO of Armco Eurotec. Appointed by the Minister of Public Works in Italy, he served for many years on the Experts Committee for the Environmental Protection of Venice. He contributed to the study of Legge Merloni, the general policy regulating public works in Italy, and served as Vice President of both A.C.A.I. and Federcostruzioni. He is a member of the Management Center of Europe, the American Marketing Association, the Council for the Management Committee of Engineering Industries, the Commission Reti Appalti Pubblici, and a founding member of Verso L’Europa. He earned his B.S. in Economics in Italy and his M.B.A. from Ohio University in Cleveland.